By Xah Lee. Date: 2018-06-12 . Last updated: 2018-06-30 . Some unicode symbols, now become emoji, which makes many math symbols such as ↔ not usable. 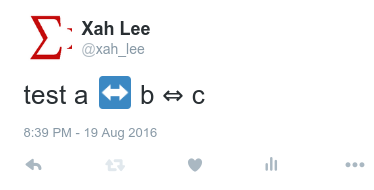 Unicode U+2194: LEFT RIGHT ARROW ↔ becomes pictograph. But U+21D4: LEFT RIGHT DOUBLE ARROW ⇔ remains text. When is Text, When is Emoji? Some characters have both emoji and textual presentation. Some characters have only emoji presentation. Some characters have only textual presentation. For those that have both emoji and textual presentation, Unicode specifies which one should be default. A “Variation Selector” can be used to chose a presentation. “Variation Selector” is a invisible character. It indicates a rendering preference for the character before it. Browser or application do not necessarily respect the variation selector. For example, twitter renders vast majority of emoji as emoji, and ignores the variation selector. There's no programable way to tell which character have both emoji and or text presentation. Variation Selectors is used to indicate a desired presentation. Variation Selectors are invisible characters. A Variation Selector is placed immediately after another character, to indicate a preferred rendering. There are 16 Variation Selectors, from code point U+FE00 to U+FE0F. They are abbreviated as VS1 to VS16. Variation Selector 15 and 16 are used to indicate text rendering or emoji rendering, for those character that have both presentation. “U+FE0E: VARIATION SELECTOR-15” → indicator for text rendering. “U+FE0F: VARIATION SELECTOR-16” → indicator for emoji rendering. Here's 2 characters with both emoji and text presentation. Which Characters Can Become Emoji? The following can be emoji or text, default to emoji. The following can be emoji or text, default to text. The following can only be shown as emoji. This table shows all character that have emoji and or text presentation. It's not well written. Very confusing.